The Pirates of the Vistula Twilight 2000 Module has officially ended with the sinking of the Vistula Queen near the turning basin of the community of Sielce. 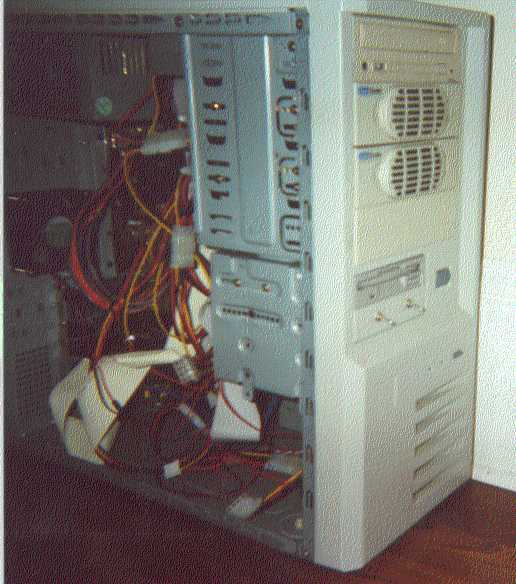 Locust is my Frankenstein’s monster, an amalgamation of spare parts collected over the years to make a fourth computer that I could tear down and reformat to suit whatever I wanted to test at the moment, without losing any settings or data. You can find it’s history here, but what has always bothered me was the ugly, worthless $30 case I bought from CompUSA to house it. It was cramped, hot and I’ve been meaning to get rid of it for some time, but never managed to find something fun to house it in. 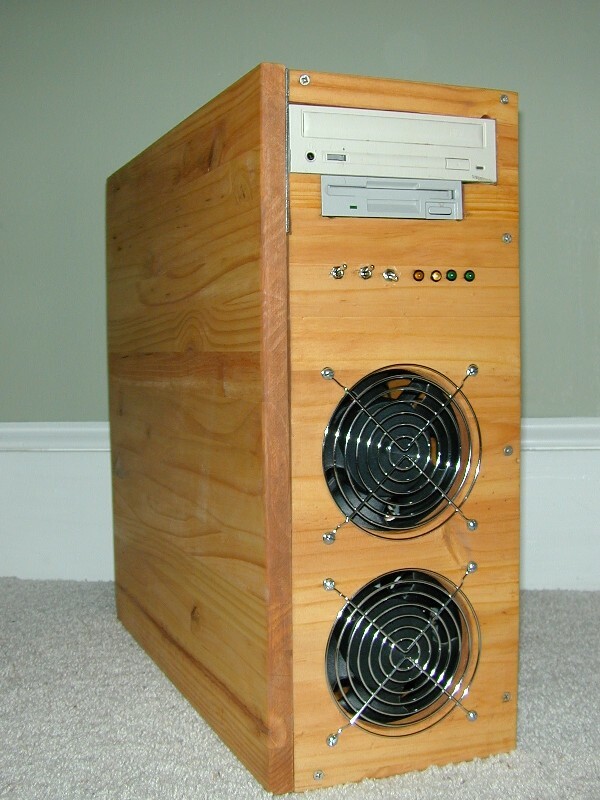 Then along comes the idea to build a wood case for it. 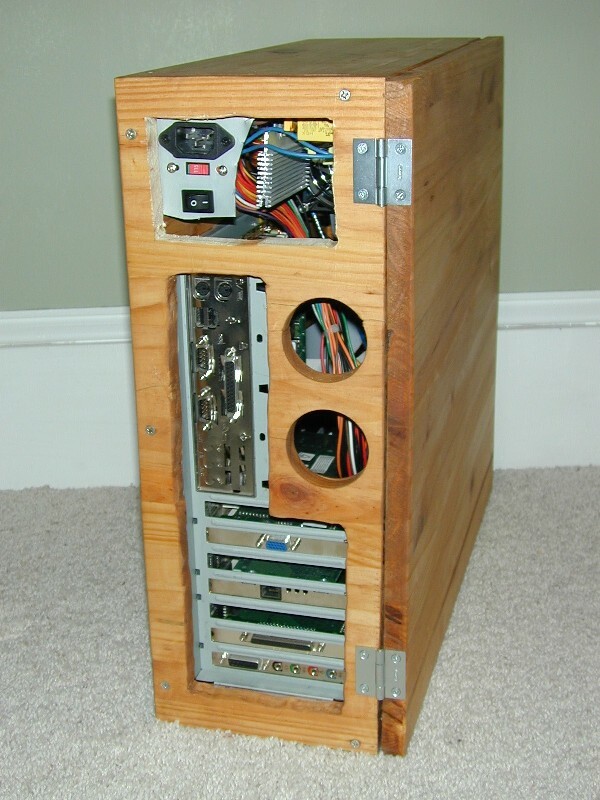 – It had to be small enough to fit with my other cases under my desk, yet large enough to be able to build the same design for all of my other computers, giving my computer pile a uniform look. – I wanted the case to be properly cooled, but I didn’t want it to be a howling tornado. In fact I wanted the case to be as silent as possible, as I wanted to be able to leave all four of my computers on all the time and not go deaf. – It needed to be functional but stylish. 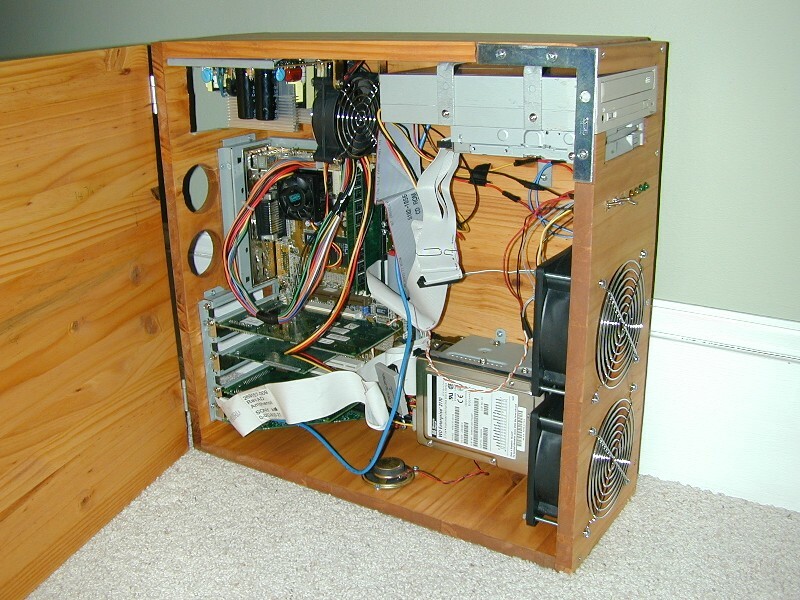 For this design I used the motherboard tray and PCI card holder from the old case. 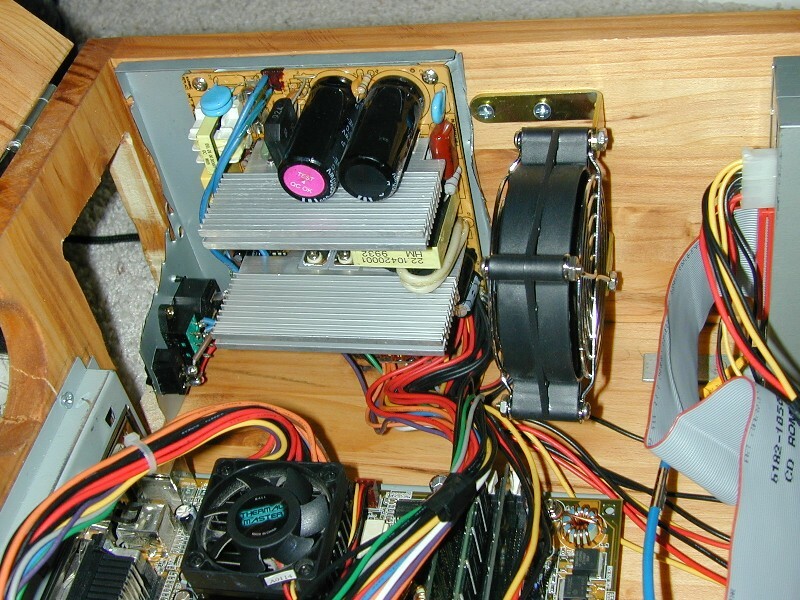 I used the 3.5″ hard drive rack from the case as well to hold the two drives in front of the fans. In my next cases, I’ll be using parts from the Addtronics parts list found here. I used 5/8″ pine laminate which is essentially strips of pine glued and pressed together to form a stripe effect found in chopping block tables and counter tops. It makes for a good looking case, and is relatively easy to work with and not all that expensive (about $15 for a 24″ x 48″ piece). The only problem with the laminate is that it tends to crack along its seams while drilling fan holes, so one must be careful about that. The inside is set up as per the visio layout. 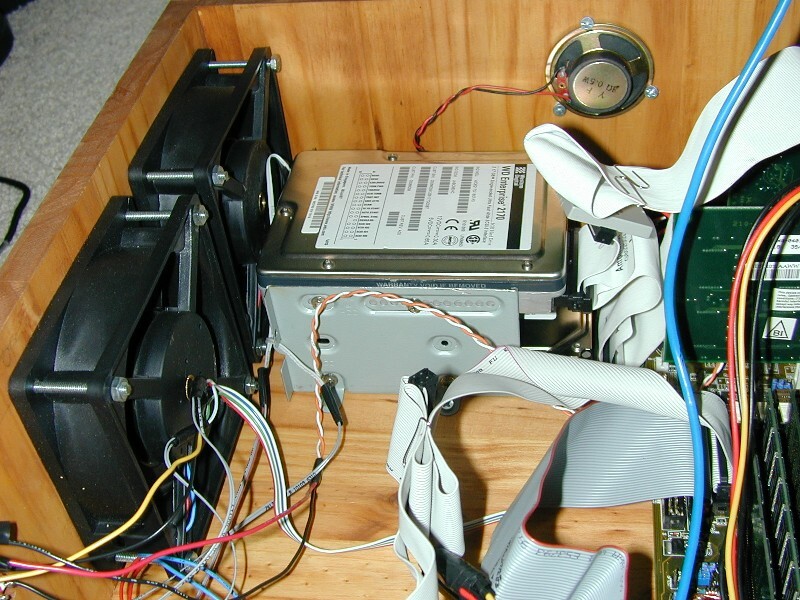 The only real trick was in mounting the brackets for the CD-ROM and floppy. That involved some dremel work and drilling new screw holes in the brackets to line them up with the holes in the units themselves. 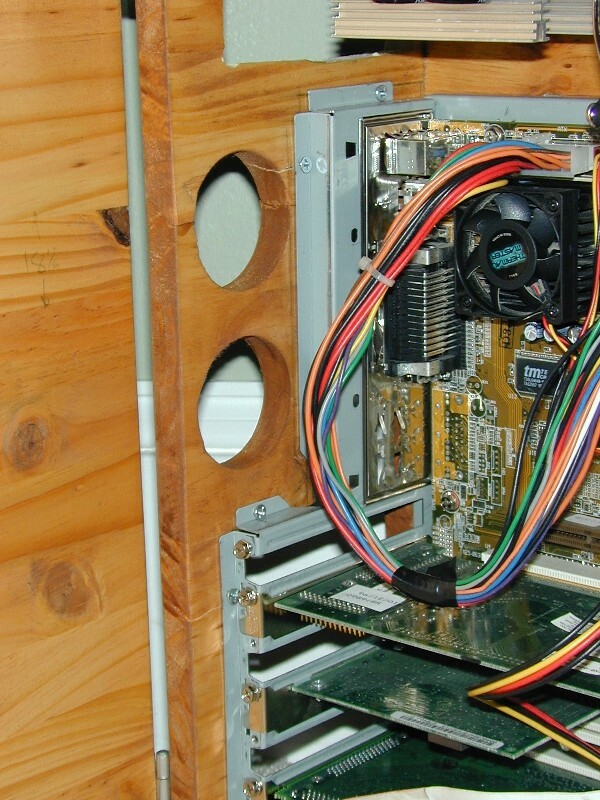 The L bracket on the upper right corner was necessary to keep the CD-ROM in place, as I cut a U shape in the bezel for the CD-ROM instead of a hole. To make the case quieter, I removed the outer casing of the PSU to remove extra passages for air to make noise through. Instead, I mounted an 80mm fan directly in front of the heat sinks to channel case air along the heat sinks and then out of the case. Likewise I cut holes in the back of the case to allow air to escape, but I didn’t add fans, figuring that the massive amount of air coming in from the front would find its own way out the back. A shot of the two hard drives in a three drive rack, allowing air from the fans to blow between them for added cooling. The wiring of the case was the most fun part of the project. I used two momentary toggle switches for the power and reset buttons, and a two-position switch for my 7v-12v mini fan bus. 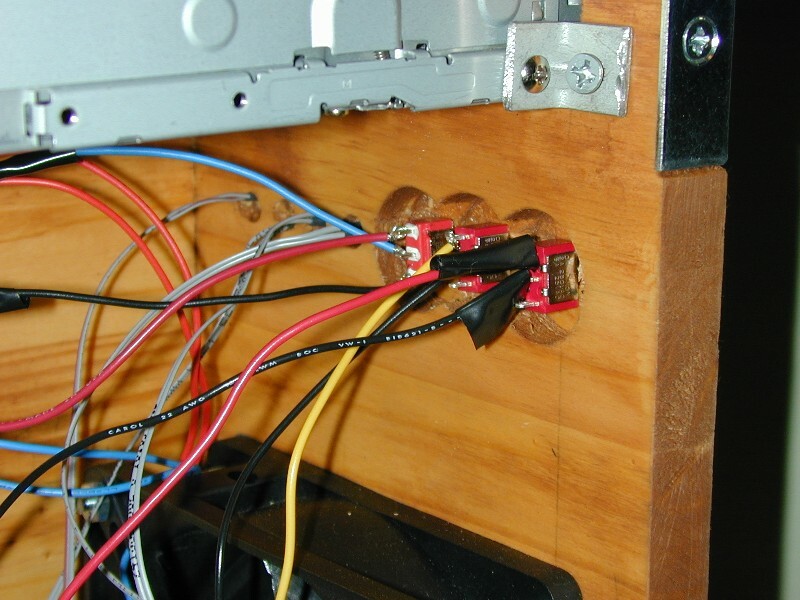 I ended up using a 1″ drill bit to drill positions for the switches through the thick wood, making sure not to drill all the way through. 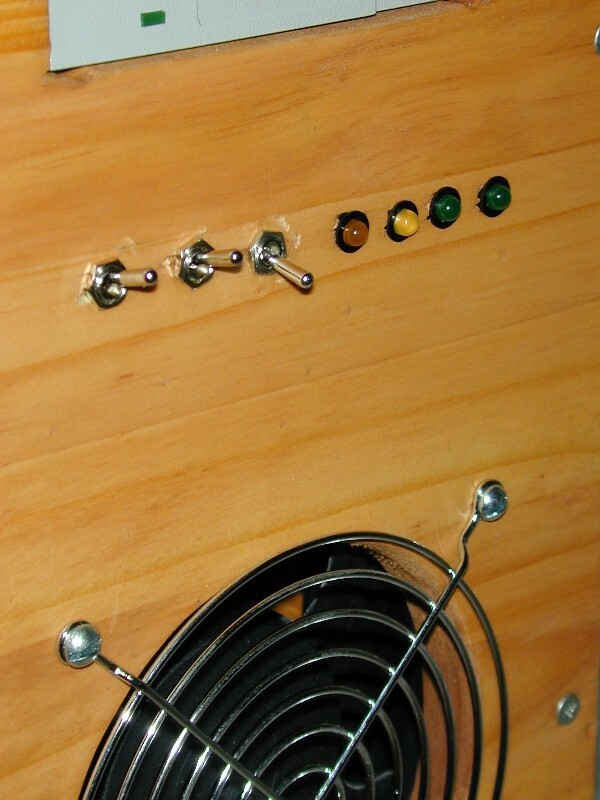 I then finished the hole with a smaller bit to allow room for the threaded tip of the switches to poke through the bezel. The four LEDs on the right are, from left to right: Power, IDE activity, SCSI HD 1 activity, SCSI HD 2 activity. 1. Evening one was to cut the pieces and assemble the case. 2. Evening two was to sand everything and stain it. 3. Evening three was to mount the drive bracket, motherboard tray and PCI card holder, CD-ROM and floppy in their brackets. 4. Evening four was to do the wiring and mount the rest of the hardware. The case meets my expectations in that it looks nicer than the old beige piece of crap, it runs quieter with only three fans running at 7v, and much cooler than it did.